This morning I plunged into the frigid Southern Ocean and spotted at least a hundred sharks milling around on the sea floor below me. I was diving off of Albany in south Western Australia next to a small island covered in New Zealand fur seals. None of the seals were in the turbid water and as I descended towards the sharks I scanned the area for Whites, rationalizing to myself that if I saw one in the distance it wouldn’t try a sneak attack. Back in the 70’s Albany was a thriving whaling community, its waters continually bloodied from the slaughter of Southern Wright whales, Humpbacks, and Blues. Back in those days, White sharks would launch themselves up the fleecing ramps to tear off chunks of blubber before the whalers could secure and render their catch. Today, the few remaining whales are fully protected in Australian waters and the Whites have largely moved away or themselves been taken by anglers. Still I kept a wary eye on the grey fog around me and slowing my descent, I touched down lightly in the centre of the darting sharks. There were over 100 individuals but fearlessly I stood my ground spurred on by the fact that the largest of the pack was barely 12 inches long. What I had come to photograph was a huge aggregation of baby Port Jackson sharks. Fully grown these curious looking sharks top out at around five feet in length, but these little guys (probably less than a month or two old) were a mere fraction of that size and many would probably not get much bigger, falling prey to larger sharks and mammals. Trying not to stir up the sand, I edged towards the closest sharks, marveling at their bold markings. Each had a distinct, chocolate brown bridle, seemingly air brushed onto a hazy background of beige and cream. The overall effect was quite dazzling in my camera’s bright strobes, yet when my lights pointed away, the sharks blended perfectly into the patchy sea grass and sand. 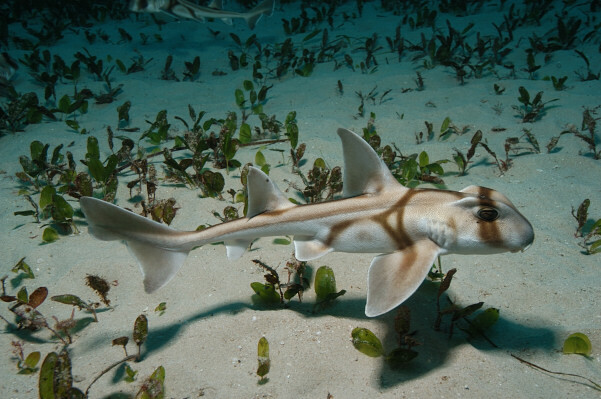 Port Jackson sharks are part of the family Heterodontidae or Bullhead sharks. In keeping with their scientific name which literally means different teeth, they have sharp, pointy teeth at the front and flattened, crunching teeth at the sides. This variety of biting possibilities allows the Port Jacksons to feed on small fishes as well as sea urchins and other benthic invertebrates. Earlier I asked Uwe Klinge (Captain and Owner of Dive Albany’s fast little charter boat) how he had found the nursery. He said that he usually brought divers out to play with the seals and one day the sharks had simply been there waiting. 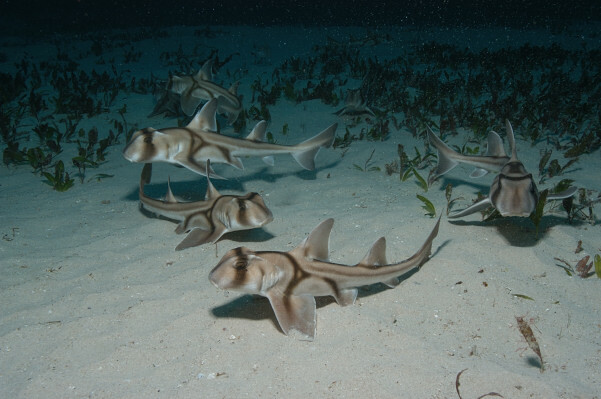 These particular sharks probably hatched from a communal egg laying site nearby, and would remain in the area until big enough to venture off from the group, into deeper, offshore water. For the better part of an hour I bounced from one group to another trying to edge as close as possible. Most of the sharks would move off by the time I was at arms length but a few bold individuals would swim right up to my lens and pose. Before ascending I kicked off into deeper water and noted that the silhouettes of Port Jackson sharks peppered the seabed as far down as I could see. Losing count of their numbers, I lazily kicked back to the boat in mid water, now totally oblivious to the threat of White sharks. And, climbing back on board I started raving on about the Port Jacksons while Uwe grinned and whisked us away to look for more unusual Australian sharks.